At Emmet’s Speakeasy, we believe learning English should be a fun and enjoyable experience. Whatever your age or language ability, we can tailor a lesson to suit your needs. Even if you’re not sure, why not come for a free trial lesson and see for yourself! 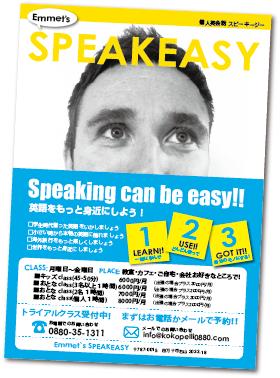 We also offer English classes specifically designed for Japanese businesses. Whether a business needs to improve their communication methods to international clients, or a Japanese service provider wants to increase their customer base with English speaking customers, we can assist. As well as designing many forms of advertising materials through our Kokopelli Creative Office, we can also include English translation with our designs. We have already completed translations for posters, flyers and specific event materials.